Diese Woche hat Sharon das Thema bei den Daring Cardmakers gestellt und sie wünscht sich Karten, auf denen sich etwas spiegelt. Für mich lag da ein winterliches Motiv auf der Hand – aber ihr müsst auch unbedingt die anderen Karten des Design-Teams anschauen, ganz besonders die von Kathy! This week it was up to Sharon to set the Daring Cardmakers challenge and she has asked for cards that contain a mirror/reflecting element. 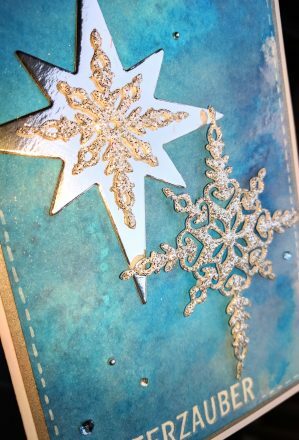 To me a winter themed card was the obvious choice – but you really need to go and have a look at the other cards the DT-members have made, especially Kathy’s! Great use of the reflective elements, a lovely frosty look to this! Oh! You are sooooo kind, what a lovely surprise to find here! 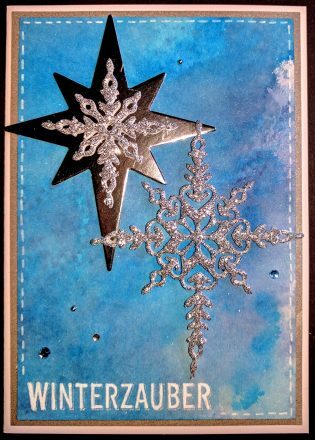 Lovely card – the stars are just beautiful and I love the background.